I'm sure that many of you will be participating in the PCTB5 - our great box of goodies that travels around this great country to your home. Well over the course of 2019 this box, or something like it, will be making its way around the P&C Meet Ups across the country. Come to the Meet Ups and you will be able to walk away with up to three samples from the Sample Box. If you are organising a meet up let me know so we can make sure that the sample box comes your way! samples taken can NOT be the same producer, in other words somebody cannot take two Mystic Water samples in a particular round for example. The 'host' of the box will obviously get first look and be able to take up to five samples. The caveat is that you hold the box and be prepared to either post back or post to the next meet up. I'll cover the actual postage costs on request. Man the lucky country strikes again. Get in quick other states otherwise Sydney takes the lot!! @fruityasu @Callum time to get ourselves organised huh? This is a perfect opportunity to arrange a Sydney meet up date. My wife and daughter will have their own meet up on the day of the next meet as daughter has discovered a new dress shop in Newtown.....sigh. 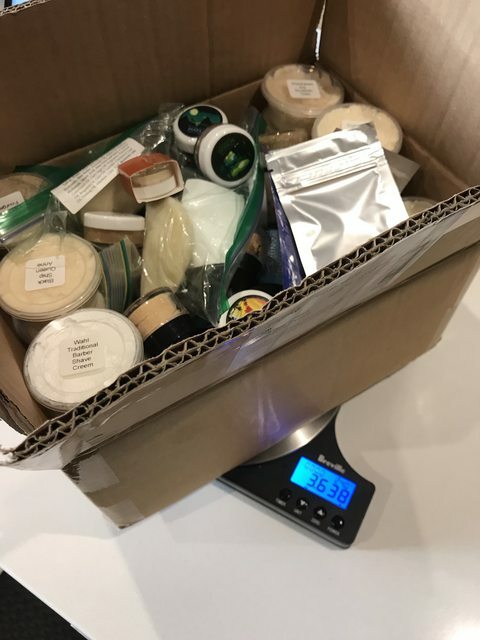 Mark, I can pick up the box at the next Canberra gathering and drop it off at the Sydney meet, if you think I can be trusted with the goodies. That would be fine - but Adelaide might get in first! The wonderful @lerenau has this box to take to the CBR Meet Up on 2 February and then post some of what is left (it will not all fit!) to @alfredus who will take that to the ADL Meet Up on 10 February. After that I know not where it goes, maybe DRW? I helped myself to small bottle of scent and a couple of soap samples from the box on Saturday - the scent was labelled "Vintage Herbal Cologne", if memory serves. Can anyone enlighten me as to what brand it is? Damn so wanted to smell that one. It's legendary for some! Oh dayum!!! Vintage Shulton! No wonder I liked it. Thank you esquire. But me thinks it may not get to Sydney for awhile. Hurry up and organise a meet up then! @astinus4 appears to have taken on the mantle of NT organiser, and has arranged a Darwin meetup at the end of the month with a few P&C lurkers and myself. But as it's on 21st Feb I think we might be too late to arrange it's safe arrival up here? Is the box going to make it to Adelaide for the Feb.10 meet-up? In the post as we speak thanks to @lerenau ! The box is currently on its way to the 10 February ADL meet up - surely we have have it in the mail from ADL to DRW to arrive by 21 February?